A pathway to a better future is being forged for another Musahar family in Ratanpur, Bihar. Meera Devi became mother to twins on October 19th, Hiramuli and Jatdev. The babies were born at home and are both underweight and in weak condition. 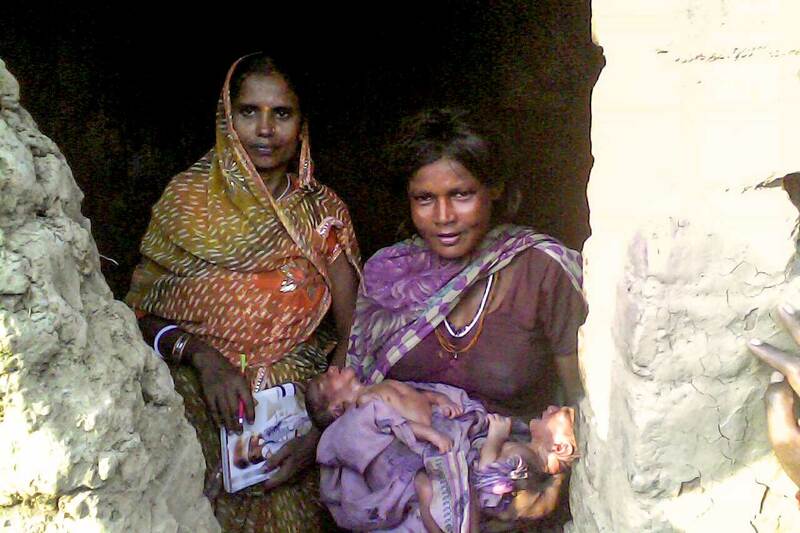 Our health worker, Urmila, and village coordinator, Nand Kishore, visited them yesterday to check on health status. The family now consists of seven children. The parents have met a doctor to begin counselling. The doctor is providing information on how the mother, 33-years-old, can gain weight and how to properly feed the twins to improve their conditions. Urmila will also discuss with parents the potential of surgery to prevent future pregnancy. This family is another to which Amrita SeRVe is also offering teaching on how to grow their own kitchen garden so they can afford more nutritious fruits and vegetables for their meals. Meanwhile, good news in developments for another Musahar family. In June, counselling was provided to to provide treatment to a malnourished child. The baby’s health has now drastically improved and steps to reach proper weight continue. Urmila is initiating similar work with other families also. The Musahars are a scheduled caste found in Bihar and Uttar Pradesh.